The gang over at Tesla are well known for making EVs that are incredibly fast and can get things done down at the drag stip embarassing normal cars on the way. The fastest of the Tesla models are the P100D flavors of the Model S and X. A new Easter Egg has been found in the settings menus for the cars that offers to enable Ludicrous + mode. That mode opens up even more performance. If you own one of the se cars and follow the steps in the video you can find the menu and enable Ludicrous + mode. However, you will be given a warning about accelerated wear of the motor, gearbox, and battery. The buttons on the bottom say yes. Bring it on or No, I want my mommy. 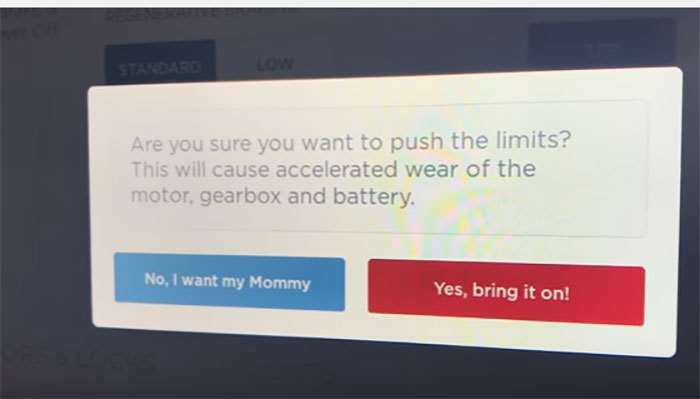 Don’t be a mommy’s boy, enable the mode. Motor be damned. With the new mode enabled a 0-60mph time of 2.465 seconds was recorded.